A glance is all it takes for it to wrinkle… but one wearing of a linen trouser, jacket, or suit on a hot humid day or night is all it takes to experience the feeling of coolness and comfort that only linen can bring. Linen is a strong, lustrous yarn of smooth surfaced flax fabrics that wrinkles easily. The fiber is actually flax. Mentioned in the Bible, linen was woven more than 4,000 years ago. While in today’s market you may find linen blended with other fibers, I recommend staying away from the 2 famous sisters: “Poly” and “Ester”. Keep in mind that nothing breathes cooler than a natural fiber. Therefore, what you gain in wrinkle resistance you lose in the coolness and lightweight comfort of linen’s natural fibers. Linen can be styled in many ways. 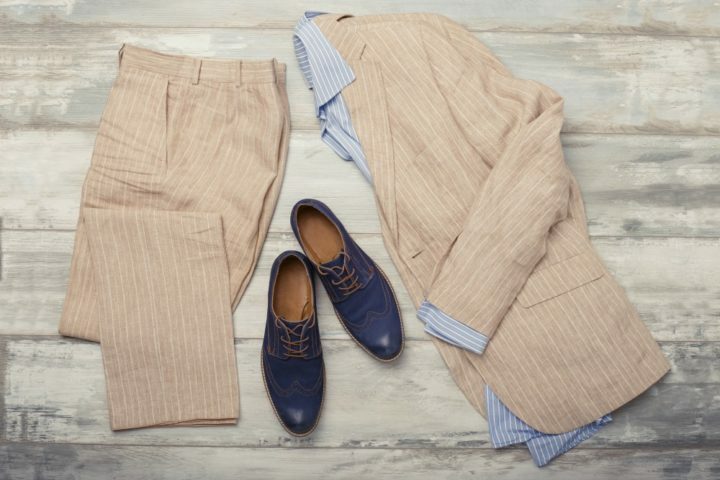 A lightweight 2- or 3-button linen suit with flat front trouser in tan or white for day wear, teemed with a blue chambray or end on end shirt, finished with a brown suede monk strap and matching brown suede belt. The linen suit coat can double as a great jacket put together on impulse with your favorite pair of denim, white, or red solid 3-button knit polo with a Gucci slip-on or a pair of leather sandals for a casual night out in the city with the guys or a Sunday brunch in the country with your significant other. A stand alone pleated or flat front linen trouser in tan, white, navy, or black — whether at the office or evening casual — looks best when paired with a solid (or patterned) linen or cotton long sleeve shirt or a short sleeve knit polo. Don’t forget… if worn on the golf course, no cuffs allowed. You have no need for sod and soil test samples from the golf course. One thing’s for sure: Linen is guaranteed to wrinkle. While you may not be in South Beach, why not experience the feeling even when you’re not there?